An all-new 2019 Chevrolet Silverado 1500 goes on sale this fall with substantial changes that should make it an excellent choice among full-size pickup trucks in a strong segment that will include an all-new 2019 Ram 1500 and an innovative Ford F-150. 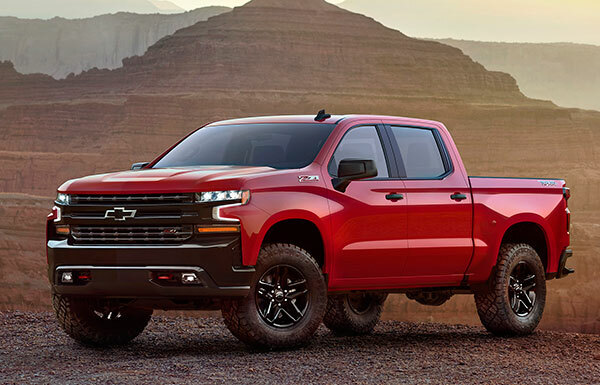 The 2019 Silverado 1500 models were revealed in Texas, then shown at the January 2018 North American International Auto Show in Detroit. Strikingly handsome but easily recognizable, the new Silverado rides on a wheelbase lengthened by nearly four inches on some models, a substantial change. Overall, the truck is 1.6 inches longer. Weight has been reduced by 450 pounds, a significant reduction. Cargo space and passenger space have been increased. The rear fender wells are stamped separately from the bed, widening the bed at the bottom by reducing the amount of space lost at the bottom edges. A dozen tie-downs are provided, which GM said are stronger than before, some upgraded to a 500-pound rating. Storage boxes that fit over the rear fender wells will be available as an accessory, likely a response to the RamBox. These boxes appear to ccover up some of the tie-downs, however. A power tailgate will be available, operable from the cab, key fob, or by hand. The toe holes into the rear bumper are larger than before, more task lighting is provided, and a 120-volt outlet is available. GM said it used a variety of materials and manufacturing methods to optimize the engineering, including seven different grades of steel, aluminum and carbon-composite. Built on a fully boxed frame made largely of high-strength steel, the new Silverado will use steel for the fixed panels, but aluminum for the doors, hood and tail gate. The bed is made of stronger high-strength steel than before, almost as a jab at Ford’s aluminum bed. The front suspension employs forged-aluminum upper control arms, while the rear suspension benefits from lightweight carbon-composite leaf springs, similar in concept to those on the Corvette. A retro Chevrolet badge on the tailgate is reminiscent of Chevy pickups from the 1950s and ’60s. Aerodynamics are thoroughly modern, however. The grille uses air curtains like those on the Camaro that reduce drag by directing air around the front wheels. The trailing edge of the roof has a small spoiler that sends the air up and over the bed and tailgate. Eight models, distinct in both appearance and equipment, will be offered in an effort to please and meet the diverse needs of a wide range of buyers. Work Truck and Custom models are intended to offer value. Top-line LTZ and High Country models will feature leather seating and upgraded exterior trim. In between will be the most popular models: LT, RST, and LT Trailboss. Trailboss models add off-road equipment, including a two-inch suspension, locking rear differential, skid plates, Rancho shock absorbers, 18-inch wheels. A new GMC Sierra will follow executives indicated will differ significantly from the Silverado. The previous-generation Silverado will be sold alongside the all-new version.